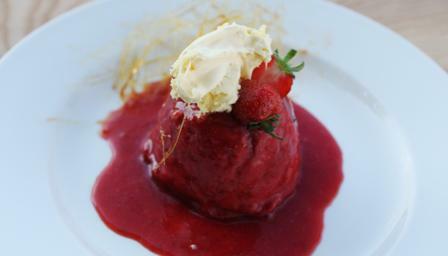 Individual summer puddings ready in less than 30 minutes - no overnight chilling required. Bruise 200g/7oz of the strawberries with a fork and stir through the basil. Set aside. Crush the remaining strawberries and pass through a fine sieve. Reserve the juice and discard the pulp. Grease two dariole moulds with a little oil and line with cling film (leave enough overhang to cover the top later). Remove the crusts from the bread. Cut the bread into two circles to fit the bottom of the moulds and two circles to fit the top of the moulds. Cut the rest into rectangles to line the sides of the moulds. Dip the small circles of bread in the reserved strawberry juice and push into the bottom of the moulds, dip the rectangles into the sauce and press firmly around the edges, taking care not to leave any gaps. Half fill the moulds with the crushed strawberries, add a tablespoon of cream and top with any remaining strawberries. Dip the larger circle in the sauce and place on top. Cover in cling film and press down firmly. Turn out the summer puddings from the moulds, remove the cling film and place onto plates. Spoon over any leftover sauce, decorate with the strawberry halves and serve with a spoonful of clotted cream and drizzle of double cream. To make a caramel, heat the sugar in a large non-stick pan until golden-brown. Use a spoon to quickly drizzle the caramel over a steel (CAUTION: sugar gets very hot). Pull the strands of caramel together to make a sugar ball and place alongside the summer pudding. Repeat to make a second sugar ball.